Since President Donald Trump has come into office, social media usage concerning political content has skyrocketed. Many have used social media as a way to express their opinions about the Nov. 8 election, ranging from rants to support. Not only have differentiating opinions cost relationships, it has also led to the inundation of fake news online, leading some people to become infuriated and distrustful of certain media outlets. However, throughout such a national upheaval, others have decided to remain neutral and spread humor. One individual is well-known Instagram personality “Daniel Nwosu Jr.” who goes by the username of @iamdanielnwosu. It then mentions that if Donald Trump cheated, then we need a round two for elections. 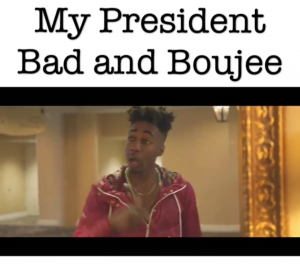 Because Nwosu’s lyrics seem to side with those against Trump, he said many have made comments about him being a “stupid liberal,” but in reality the video simply showcases differentiating viewpoints. “In other videos I’ve done, I’ve always told people how we should just accept Trump as our president. At one point in the song, I even talk about how the media is never neutral and is always one sided,” said Nwosu. Watched the news I bet they fooled ya. Nwosu is questioning the media and their intentions. It also describes someone who is “flossin’, ballin’ [and] one who possesses swag; elite, rich”. Nwosu believes that Donald Trump is one of the most “interesting” presidents we’ve ever had. The video captivates some of its viewers due to the visual elements that flow coherently with the words. In one scene, there is a close up of the Trump Towers, and in another a Washington Post news article about a CIA assessment on Russia helping Trump win. Since the video was first posted, it has received over 33,000 views on Instagram and as well as over 100,000 views on YouTube.